I bought a craft magazine recently and it had some free stamps with it - who doesn't like free stamps eh? The base card is some textured Coastal Cabana card stock and my scene is sponged on to a piece of die cut card. The dies are from the Apothecary Accents set along with the two one I used to place each side of the scene. 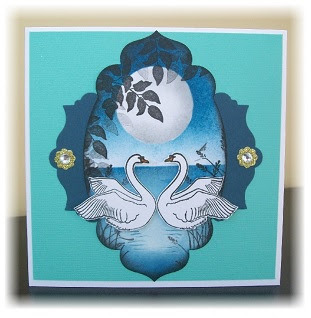 The swans were stamped and cut out before attaching to the card with 3D foam pads.